US President Barack Obama speaking in the Rose Garden. During the chaotic week of the Boston bomb attacks, Barack Obama finally did something a lot of people had been waiting for: He got angry. In public. In the Rose Garden. It happened after the Senate had shamefully failed to pass a bill, favored by the overwhelming majority of Americans, requiring background checks for gun purchasers. 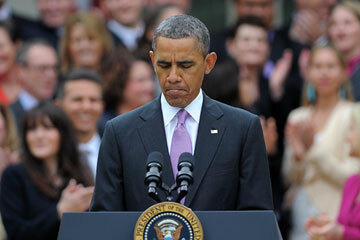 "The gun lobby and its allies willfully lied about the bill," he said. "They claimed that it would create some sort of Big Brother gun registry even though the bill did the opposite ... Those lies upset an intense minority of gun owners, and that in turn intimidated a lot of Senators." Assorted Republicans were put off by Obama's passion. The conservative columnist Charles Krauthammer falsely claimed that the President had falsely claimed that the background-checks bill would have prevented the Newtown massacre. Krauthammer also said that helping the victims' families lobby for the law was "emotional blackmail." The conservative pundit and former Bush functionary Pete Wehner--who occasionally professes a desire for moderation but just can't help himself when it comes to the President--called Obama's behavior "demagoguery" and described it as a "Lear-like" rage. To which I say, Bring it on, Mr. President. Obama's anger served a larger purpose. It was directed at the plague affecting--no, paralyzing--our public life: the ability of well-funded extremist groups to thwart the will of the overwhelming majority. This is a problem that goes well beyond the gun issue. It has infected liberal and conservative lobbying groups alike. Their constant screeching defiles the mass media and drowns out voices of sanity. Their give-no-quarter politics defines our time. The President finally reflected the public fury I often hear when I travel the country. His outburst should be a guide to other Washington politicians. It is well past time for political moderates to speak as forcefully as the snake-oil salesmen who are hijacking our democracy. I include among the demagogues Democrats like Jim Dean--former governor Howard Dean's brother--who recently sent out a fundraising letter titled "Disgusted," which began with this subtle enjoinder: "President Obama's budget has left me absolutely disgusted." Really? Why? Because the President has called for very modest cuts in old-age entitlements. I also include both sides of the abortion debate, public employees' unions that won't change their work rules, the gun lobby--obviously--and its liberal doppelgänger, the civil-libertarian lobby. Innumerable other groups fester, waiting for the chance to raise funds off the paranoia of their supporters. The oil barons and financial wizards and labor unions all use the same maximalist tactics on their targeted politicians: If you oppose us, even a little bit, we'll slide the slippery slope toward socialism (or whatever)--and you will pay come election time.